A. Read the survey responses about travelling by plane. B. Write a one-paragraph survey article to answer this question: Is flying by plane a good way to travel? Give reasons and examples to support your answer. Include some of the results from the survey in the table. Use reported speech to give examples from the survey. Use although, even though, despite, in spite of, nevertheless, or however to contrast ideas. Travelling by plane has its problems, but survey results show that many people do travel by plane. In a recent survey, 62% of the people surveyed said that the biggest problem with flying was that flights were too expensive. Other problems included delays and difficulties getting through security. However, these problems do not stop people from flying. 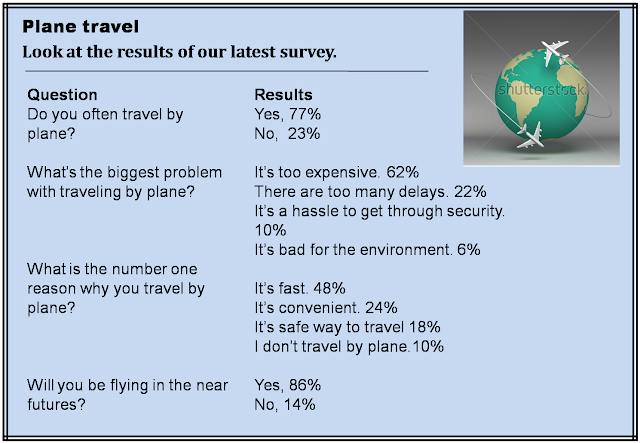 Despite the problems, 77% of respondents said they often travelled by plane. The top reason given by 48% of those surveyed was that plane travel is fast. Others said it is convenient or safe. The survey clearly shows that plane travel is a popular way to travel. Although flying has its problems, many people choose air travel.